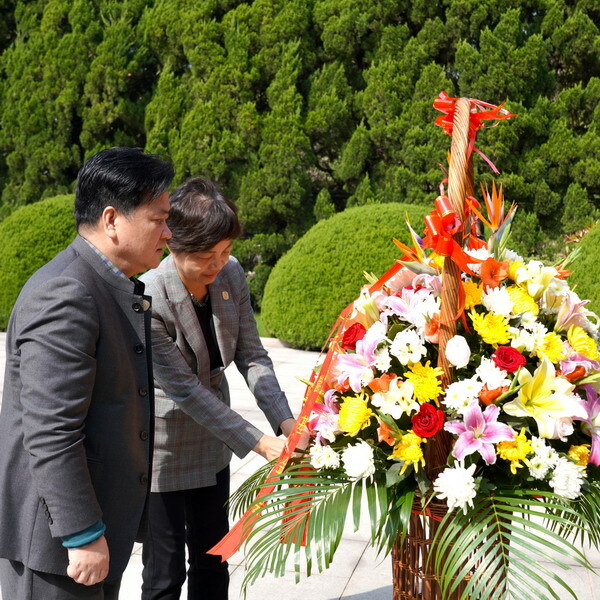 On the eve of the Qingming Festival, all the staff members of the Shanghai Soong Ching Ling Foundation came to the cemetery of Soong Ching Ling, the honorary chairman of the People's Republic of China, to pay tribute and respect to her. 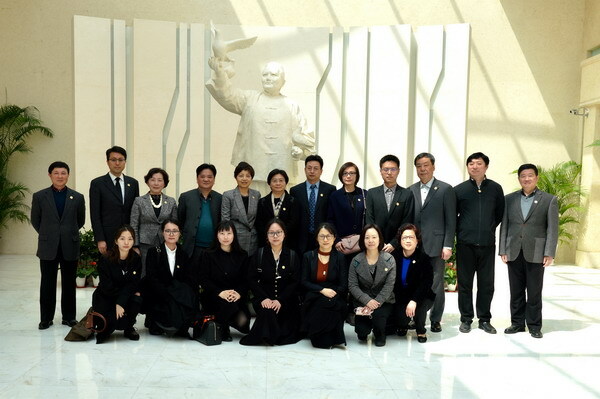 At 9:30 a.m. on March 29, accompanied by Xue Chao, president of the Shanghai Soong Ching Ling Research Institute, SSCLF’s executive vice chairman Zou Wei, SSCLF’s acting secretary general Jia Yong, SSCLF’s party branch secretary Shu Min, and all the staff members, wearing the foundation’s emblem, dressing solemnly, stepped into the mausoleum in orderly manner. Accompanied by the soothing melodious "Tribute Song", in a solemn atmosphere, Zou Wei and Jia Yong went forward to lay a basket of flowers in front of the white marble statue of Soong Ching Ling, and all staff members of SSCLF neatly lined up in front of the statue, expressing mourning. Then they walked slowly to the tomb, bowed three times to Soong Ching Ling's tomb and presented yellow carnations, expressing their deep memory for the great fighter of patriotism, democracy, internationalism and communism. Finally, they came to the foreigner tomb area and put flowers on the tombstones of Talitha Gerlach, Ruth F. Weiss and Dr. Kranzdorf. After the ceremony, they visited the Soong Ching Ling Memorial Hall and the Universal Cemetery. Through the activity of tomb-sweeping day, they deeply cherish the memory of and review Soong Ching Ling’s great life, and further strengthen their ideals and beliefs. Every staff member of SSCLF will never forget the original intention, keep the mission in mind, forge ahead bravely, continue to uphold the spirit of Soong Ching Ling, and continue to promote Soong Ching Ling’s public welfare and charity causes.